Overnight snow has caused travel problems in Derbyshire as East Midlands Airport and several schools closed. Up to 5cm (2in) of snow fell on Sunday night and more is expected. More than 100 Derbyshire schools have shut and Derbyshire County Council said gritters had been out all night to keep the main roads clear of ice. 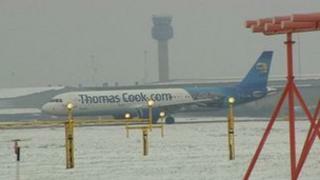 Flights at East Midlands Airport resumed at 14:05 GMT after poor conditions closed the runway. Passengers have been advised to check with their airline for updates. An airport spokeswoman said flights had to be suspended from landing or taking off while snow was cleared and checks were carried out. Jeff Counsell, managing director of Trent Barton buses, said routes had been significantly affected. He said: "The gritters have been out in force but the problem is they just can't get everywhere and many of our bus services penetrate residential areas, villages and estates where we are finding it really hard to get out." Meanwhile, work to refurbish three bridges on the A52 St Alkmund's Way in Derby, which had been due to start earlier, has been postponed because of the weather conditions. Derby City Council says its Wetherby Day Centre for Adults with Learning Disabilities is shut.